It’s a difficult decision to get married in a foreign country, I didn’t know any close friends. Internet research offered up little help and visits to travel agents left us with very limited choices in terms of hotels and options for how our day would be. It was one package fits all approach with little room for manoeuvre. 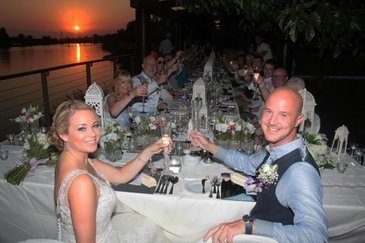 We knew we wanted to get married in Turkey having holidayed there for the last 5 years, it had become very special to us. Having visited numerous hotels we had built up a list of what we needed from the hotel and hadn’t quite found one that had everything. Having returned from our latest visit in May 2014 from a hotel which we thought was ‘the one’ we came home disappointed and unsure of what to do and quickly running out of time as we had pencilled in the date for September 2015. Following numerous hours on the internet we came across the Gloria group of hotels and between them they ticked all the boxes so we approached them about wedding packages. They put us in touch with their partner, Wedding City Antalya to answer our queries. Our emails were met with positive and informative replies, we always had a prompt response and this gave us the confidence to take things to the next step. We booked a holiday to the Gloria Golf hotel September 2014 and arranged to meet the wedding coordinator while we were there. They arranged for the hotel management to attend and took us on a tour of possible venues within the Gloria Golf and the Gloria Serenity. After much debate and spending time at both, we felt that the Serenity was better for the wedding itself but as we had children in our party, they could stay at the Golf, which was much more suitable for families, but still attend the wedding. We gave the wedding coordinators 3 dates to keep for us until we returned to the UK to check flights etc. We were very unsure about the legal process but the coordinator sent us a sheet with each step we needed to do and actually it was a lot less complicated than we thought it would be. We even sent them copies of our paperwork and they took them to the registry office in Turkey to check they were ok before we flew out with them. This was a huge weight off my mind as I was worried about us getting there and something being wrong, and once we were in Turkey it was too late to do anything. They double checked with us before we left that we had everything required, which was very helpful.